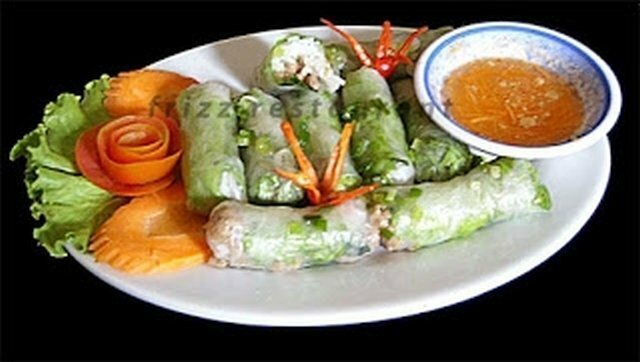 Crispy vegetables spring roll with tofu, taro root, cabbage and carrot is very delicious. Khmer vegetarian spring roll is so good that most my friends can’t tell it made without meat. Mixed shredded taro root and carrot in a large mixing bowl, and use your palms to squeezes out all it liquid then put it back in the bowl, add tofu, onion, garlic and cabbage, mixed well. Seasoning with sugar, soy sauce and black pepper, mixed well and set it a side. In a small bowl, mixed water with cornstarch together, mix well and set a side. Gentle pulls out each spring roll shell to separate from other shell. Lay one sheet flat on a cutting board or plate, spoon mix vegetables and put on 1/3 of the shell. Wrap the vegetables filling in spring roll shell, roll it tight and seal the end with cornstarch water, continue make spring roll till filling gone. Note: If you haven’t made spring roll before, look at the back of spring roll pastry package, it has illustrated instruction for you to follow. Heat 6 cups vegetable oil in high temperature. When oil is hot, deep fried spring roll till crispy golden brown. Removed spring roll from hot oil and put on a plate covered with paper towel to drained oil. Serve hot with sweet soy sauce, or with rice noodle and vegetarian fish sauce.